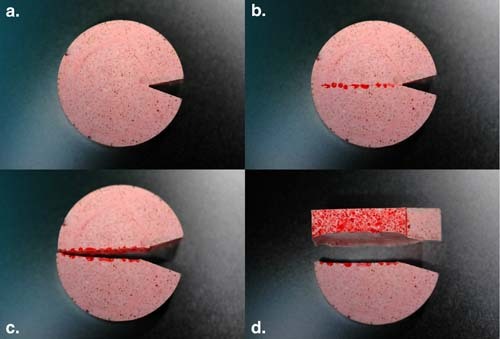 Images of a self-healing test specimen with red dyed microencapsulated healing agent embedded in the epoxy matrix. Cracks form in the matrix wherever damage occurs. A crack ruptures the microcapsules, releasing the healing agent into the crack plane through capillary action. The two halves of the specimen after it has been fractured into two pieces. On the crack faces, red healing agent is released from ruptured urea-formaldehyde microcapsules embedded in the epoxy.